Our range of products include industrial biomass briquette, biofuel briquettes and wooden biomass briquettes. We are dedicatedly involved in offering a wide array of Biomass Wooden Briquette that is known as a biofuel substitute to charcoal and coal. Offered briquette is immensely used in industrial boilers to produce electricity from steam. 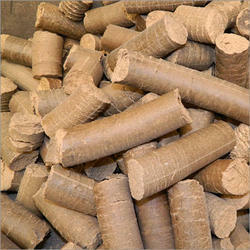 Having high fuel efficiency, offered briquette is widely demanded in the market. Besides, the entire array is we checked by our professionals so as to ensure its high quality at client’s end.